The optic nerve is the second nerve out of the twelve cranial nerves. It is a sensory paired nerve transmitting visual or sight information from the retina of the eye to the brain. The optic nerve carries the impulses from retina to the brain in the form of images. During the embryonic development, the optic never is considered a part of the CNS or Central Nervous System. The optic nerve in humans extends to the optic chiasma from the optic disk and continues to the optic tract to the pretectal nuclei, superior colliculus, and geniculate nucleus. The optic nerve is peripherally located at the back of the eye. It begins at the optic disk, which is a structure 1.5 mm or 0.06 inch in diameter. There is an accumulated space for the optic nerves at the back of the eyeball where approximately 125 million nerve fibers prepare the optic nerve mass. As a single unit, optic nerve passes through the optic canal and enters the brain via cranial cavity. 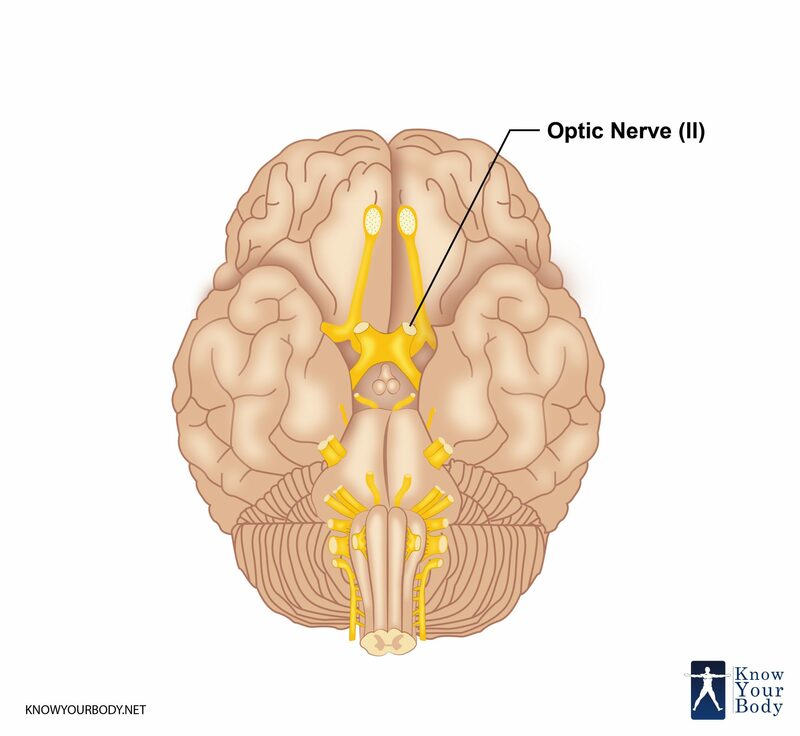 There is a separate optic nerve for each eyeball and the two optic nerves meet at one point diencephalon, which creates a single nerve called the optic chiasma. The optic nerve results from the optic stalks during the 7th week of the embryonic development. It is composed of glial cells and retinal ganglion cells. The word ‘optic’ has been derived from the Greek word ‘optikos’ related to the sight. 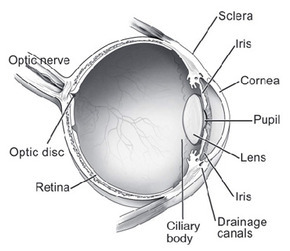 Besides optic nerve, the other parts of an eye are the cornea, pupil, retina, vitreous, iris, lens, and macula. 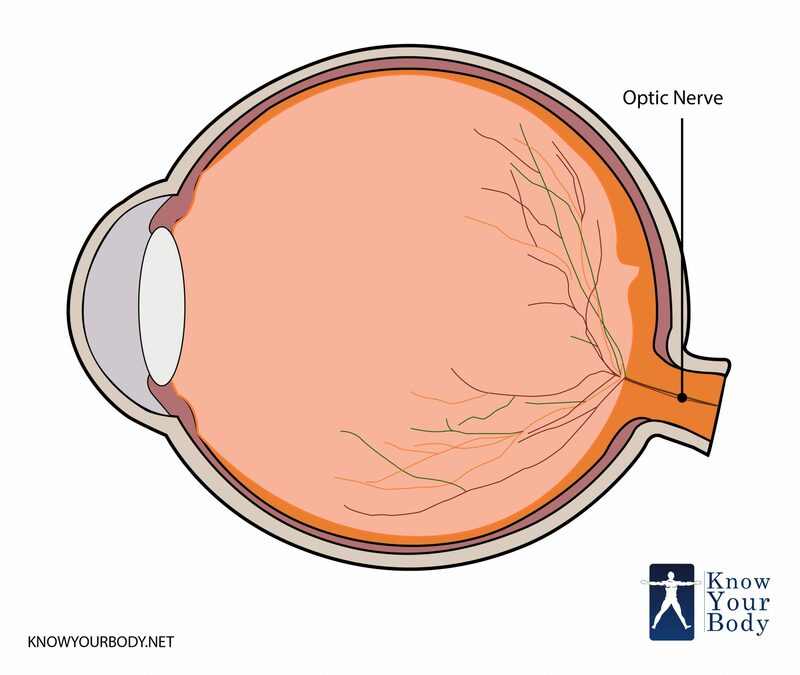 The length of the optic nerve varies widely from person to person and even in one individual. Usually, the length of the optic nerve is 35 – 55 mm beginning from the eyeball to the chiasma. The chiasma is an intraocular part of 1 mm length, the intracanalicular part of 4-10 mm length, intraorbital part of 25 mm length. The starting point of this nerve is the optic disk, which is a structure of 1.5 mm length. The optic disk is created from the gathering of ganglion cell output fibers known as axons, which pass out through the eye. When the optic nerve reaches the back of the eye, it passes through the remaining part of the posterior orbit known as the eye socket. From there it moves through the bony optic canal to extend intracranially on the underside of the front portion of the brain. From this point, the optic nerve from both the eyes come together and meets each other forming an X-shaped structure known as optic chiasm. From here, around one-half of the nerve fibers from each eye continues to move along on the same portion of the brain, while the remaining nerve fibers intersect at the chiasm to link the fibers from the opposite eye moving towards the other portion of the brain. It is an important arrangement of the nerves for releasing proper binocular vision. Subsequent to the optic chiasm, the nerve fibers move in optic tracts to the various areas of the brain, mainly the lateral geniculate nuclei. There are fibers in the geniculate nuclei that create the optic radiations that move towards the visual cortex situated in the occipital lobes exactly at the back of the brain. There are few nerve fibers that leave the optic tract without entering into the geniculate nuclei region. Rather, these fibers enter into the brain stem to offer information that eventually decides the size of the pupil. It is the part of the optic nerve extending from the eyeball to the optical canal. The optic nerve diameter in the retrolaminar region is almost twice the optic disc. It is because the nerve fibers are myelinated in this region. This area is surrounded by the meningeal sheath consisting dura mater, pia mater, cerebrospinal fluid, and arachnoid matter. This section includes the bony optical canal encompassed by the meningeal sheath from all around. The basic structure of this region is almost similar to the adjacent intraorbital part. In this section, the optic nerve lies above the region of diaphragm sellae and then above the cavernous sinus. It is in close association with the ophthalmic artery inferolaterally, carotid and internal artery laterally and the canal. The ophthalmic artery is always linked to the surface of the optic nerve through a meshwork of vascular connective tissues. The optic nerve is a component of the eye, but it is not the part of the peripheral system. It is an integral part of the Central Nervous System. The core function of the optic nerve is to gather all visual information from the eye and take it or transmit it to the brain. For this, the optic nerve uses a series of electrical impulses to the portion of the brain that functions as the vision centers. These vision centers allow making sensing of everything that you see. One optic nerve is prepared from a bundle of more than one million nerve cells fibers, particularly the Ganglionic cells that function together to ensure that you are able to see properly. Also, the region or spot where the optic nerve leaves the eye does not include any photoreceptors. For this reason, this spot is known as a ‘blind spot’. The intracranial parts and the chiasm of the optic nerve receive the blood from the small branches of the ACA as well as from the superior portion of the hypophyseal artery. Whereas the optic tracts of the optic nerve receive the blood from the small branches of the anterior choroidal well as from the PCom arteries. If the optic nerve experiences damage then this can result in temporary or permanent clinical complication. The permanent complication can be so severe that it can result in complete loss of vision or abnormal pupillary reflex, which can be identified through a diagnosis. If this type of damage occurs, then it can result in loss of vision in the eye on the same side where the damage has occurred. This type of damage results in another severe clinical complication causing loss of vision laterally in both the visual groups known as bitemporal hemianopsia. Such damage can cause large pituitary tumors known as the pituitary adenoma. The optic tract is located behind the posterior to the chiasm. Damage to this portion of the optic nerve can result in loss of the entire visual domain from the side opposite to which the damage has occurred. So, if the right side of the optic tract is damaged then this will result in loss of vision from the left side. There can be various causes of an injury to the optic nerve. These clinical complications can occur because of inheritable problems or congenital problems such as Leber’s Hereditary Optic Neuropathy, trauma, inflammation, infection, ischemia, glaucoma, and toxicity. Even there can be a compression from aneurysms or tumors that can result in injuries and ailments to the optic nerve in individuals of less than 50 years. The compression of anterior ischemic optic neuropathy can result in ailments in individuals more than 50 years of age. It is a group or series of ailments involving loss of ganglion cells of the retina. This ailment causes the optic neuropathy pattern of the peripheral vision loss, which will initially cause sparing central vision. This disease is linked to the increased intraocular pressure that damages the optic nerve from the point where it exits the eyeball. Primarily, glaucoma is an ailment of the nerve. This disease is commonly called the ‘stroke of the optic nerve.’ It is an ailment of the optic nerve head. It occurs when there is a sudden loss of nutrients and blood supply to the head of the optic nerve. It results in complete and sudden loss of vision, usually during the morning time after waking up. It is a common condition among individuals of 40 – 70 years. This is an inflammatory disease of the optic nerve that is linked to various other harmful ailments, the most noteworthy being the ailment of multiple sclerosis. During this disease a patient experiences loss of vision and pain in the eye. It is deemed to be an episodic condition. This ailment occurs when the optic nerve is underdeveloped or partially developed. It results in complete loss or partial loss of vision. Besides these ailments, there can be other diseases affecting the optic nerve. Tumors, particularly of the pituitary gland place pressure on the optic nerve. It can cause a severe visual loss of different types. Also, swelling of the blood vessels known as cerebral aneurysms can result in ailments in the optic nerve. Traumas can also result in intense injury to the nerves and can lead to the problem of direct optic nerve occurring from a penetrating injury to the orbit of the eye. But, there are few indirect traumas that can damage the head impact or stretch movements to the optic nerve. There are a plethora of diseases related to the optic nerve. The pattern of diseases plays a pivotal role in determining an appropriate treatment for an ailment. While most of the ailments in optic nerve are untreatable, still it is tried to recover the vision to as much extent as possible. For this, the process of diagnosis in ophthalmology is carried. Along with this, the abnormal physical signs are determined, such as color blindness, improper vision or deterioration in the vision. Once the type of disease is identified then it is treated with a surgery. But, most of the times the ailments in optic nerve are untreatable and result in total vision loss. What leads to inflammation of the optic nerve? Inflammation of the optic nerve results in an ailment known as optic neuritis. This inflammation can result from an infection or another disease in the body. Usually, this type of inflammation affects one out of the two eyes. How Glaucoma affects the Optic Nerve? Glaucoma can cause the cup in the optic nerve head to get enlarged. If such a situation is identified, the related tests for Glaucoma are conducted. 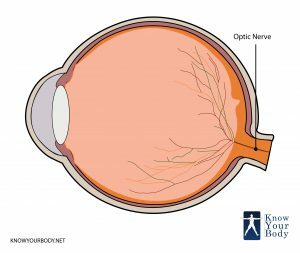 Why does optic nerve not regenerate? RCGs or Retinal Ganglion Cells are usually not able to regenerate their axons after experiencing any damage or injury. As a result, the optic nerve is not able to regenerate leads to lifelong vision loss. Is it possible to replace the Optic Nerve? According to the studies carried to date, it is not possible to restore the vision loss due to glaucoma. However, there are large numbers of studies still going on to repair optic nerve cells. Might be it is possible to repair the optic nerve in the future.